It doesn’t take a trademark lawyer to figure out that the 2013 Ford Fusion is one hot mid-sized sedan. But did you know that in 2004, a year before the Fusion’s release, Ford was actively planning to call it Futura? Some history on the Futura nameplate: the name was originally used on two-door (sedan and coupe) models of the Fairmont, which itself replaced the Ford Maverick. The Futura was made available for the 1978 model year and — compared to its Fairmont sedan and wagon counterparts — was distinguished by a different roofline as well as a unique two-piece vinyl roof with an upswept central roof band commandeered from the larger and more up-market Ford Thunderbird. The Fairmont Futura was discontinued in 1983, giving way to the Tempo in 1984. The Futura name was never used since… until — around 2003, Ford decided to resurrect it for use on its new mid-sized sedan. 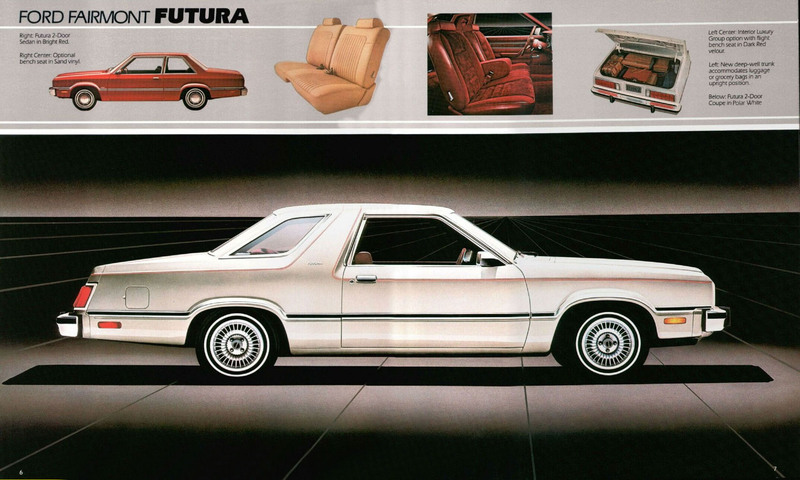 Ford Fairmont Futura Brochure. Notice the Futura was available in a 2-door "sedan" (red, above) and "coupe" (white, below). Click image to expand. That never took place, as Ford lost a trademark suit to Pep Boys, which markets a line of tires under the Futura brand, even though The Blue Oval still owned trademark rights to the name. You see, under American trademark law, a name is considered abandoned if the owner does not use it for an active product for three calendar years… and the fact that Ford used the name long ago was, well, history. And so what would have otherwise been named the Futura became the Fusion — not that we really mind. That said, it would be nice to drive a Futura — wouldn’t you say? Previous story Poll: Which 2013 Ford Fusion Are You Interested In Buying?